Paul Greengrass (United 93, The Bourne Supremacy and The Bourne Ulitmatum) continues his reign as the master of post-9/11 angst and grit, this time turning the true story of Captain Rich Phillips into a high-seas hostage drama that not only gives the Academy Award-nominated director a chance to flex his muscle in a slightly different milieu but also allows Tom Hanks to prove that he is still in his prime as an actor. 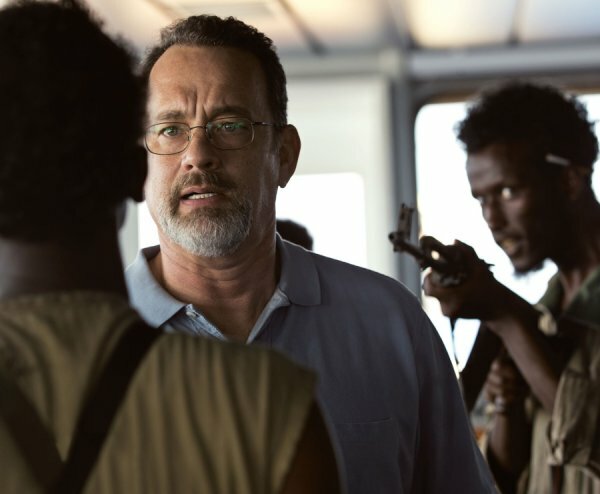 Hanks stars in the titular role, that of the captain of the cargo ship Maersk Alabama, which was hijacked by Somali pirates in April 2009. Forced to think on his feet to protect his ship and his crew, Phillips and his men improvise a series of incidents that deter the four hijackers — a mix of thugs and desperate, destitute ex-fishermen led by Muse (an remarkable Barkhad Abdi) — from continuing their ill-fated raid. The situation takes a ugly turn, however, when they depart the ship in a lifeboat with Phillips as their hostage, setting up a tense second-half stand-off with the U.S. Navy. Much like the recent Rush, Captain Phillips manages to keep us on edge even though we know how events played out. It’s the getting to that predetermined ending that Greengrass, like Ron Howard, makes so tense, compelling, and just plain stressful to watch. Hanks proves to be ideal for the job, perfectly cast as an ordinary man in an extraordinary situation and not afraid to invest the role with a little vulnerability. We admire his coolness in the face of grave danger, and we sympathize when he collapses in sobs after the ordeal ends but its weight lingers. Abdi proves to be the perfect co-star for Hanks; he uses and air of bravado masks the fact that he knows he’s in too deep, much the way Phillips confidence hides his simmering fear. Greengrass makes an effort to humanize his villains a bit, with an ersatz explanation of what drove them to lawlessness; unfortunately the rest of Muse’s gang are underdeveloped stock characters designed to serve specific plot functions and little else. So is Phillips’ crew. This is strictly a two-man tale, one that Greengrass tells with an intense, laser-like focus.